If you’ve already upgraded to Microsoft Office 2011 from an earlier edition—or are considering doing so—you probably know that e-mail, calendars, and contacts are now handled by a new application called Outlook ( ) rather than Entourage ( ). Switching to Outlook need not be traumatic, but it’s different enough that you may be disoriented at first, or have trouble figuring out how to do a few basic tasks. These tips will get you started. The first thing to keep in mind is that Outlook 2011 is an entirely new application that happens to share many of Entourage’s features, but was created from scratch. Although Outlook for Mac isn’t based on Entourage, neither is it a port of Outlook 2010 for Windows. In fact, it looks and feels like a blend of Entourage, Outlook 2010, and Apple Mail—with some of the best features of each. Navigation Controls To switch between views in Outlook (such as Mail, Contacts, and Calendars), you click the buttons at the bottom of the navigation pane (rather than in the toolbar, as in Entourage). If those buttons take up too much space, drag the divider bar above them down to collapse them into small icons at the bottom of the window. You can also navigate using the commands on the View -> Go To submenu, or their associated keyboard shortcuts. The Ribbon As in all Office 2011 applications, Outlook uses a strip of each window just below the sparsely populated toolbar to display controls relevant to whatever you’re working with at the moment. You can hide or show the Ribbon by choosing View -> Ribbon (Command-Option-R) or clicking the small arrow in the Ribbon’s upper-right corner. If you choose to hide the ribbon, you can use regular menu commands to accomplish most of the same tasks. Outlook 2011 displays many message controls on the Ribbon, which appears in a strip of each window just below the toolbar. 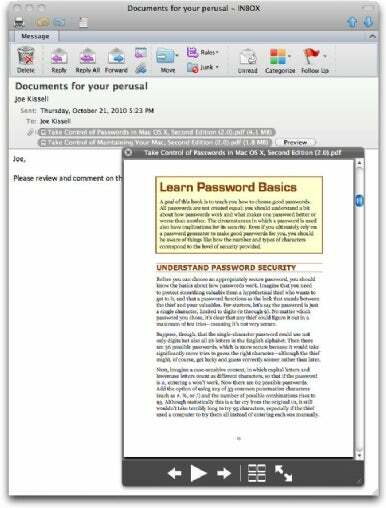 You can hide or reveal the Ribbon by pressing Command-Option-R.
Unified Inbox Outlook lets you configure as many e-mail accounts as you need, and by default, it groups all the accounts’ Inboxes under a single heading in the navigation pane, just as Apple Mail does. Select Inbox to display incoming messages from all your accounts in one list, or click the triangle next to Inbox to display each account’s Inbox individually. (Outlook also consolidates Drafts, Sent Items, Deleted Items, and Junk E-mail folders.) If you prefer to keep your accounts entirely separate, you can disable this feature: choose Outlook -> Preferences, click General, and deselect the Group Similar Folders, Such As Inboxes, From Different Accounts checkbox. E-mail Conversations By default, Outlook displays all the messages from a particular conversation (which it defines as those with a shared subject, not counting extras like “Re:”) together in your message list. This includes messages you’ve sent and messages that are filed in other folders, so that you can always follow the entire thread of a conversation in one place. Click the triangle next to the top-most message in the list to expand or contract the list of messages in the conversation. To disable this feature, choose View -> Arrange By -> and pick another option in the menu. Some of the new features in Outlook that aren’t in Entourage can significantly improve your productivity. Take a few minutes to try these out. Sharing Resources Groups of people who connect to the same Exchange server can now share resources such as calendars, contacts, and notes with each other. To do this, select the item you want to share in Outlook’s navigation pane. Then choose File -> Folder -> Permissions (or click the Organize tab on the Ribbon, followed by the Permissions button). In the dialog box that appears, you can add users from your Exchange server and assign each of them various combinations of permission to view, edit, and delete items. Shared items appear in the other users’ navigation panes. Easier Scheduling Another feature available to Exchange server users is a view into your colleagues’ schedules when planning a meeting. Create an event by choosing File -> New -> Meeting, and fill in the meetings details including the other people you want to attend. Then click the Scheduling Assistant tab to check the schedules of all the participants and make sure the meeting is happening at a convenient time for everyone. When scheduling a meeting, you can see others' schedules right in the new meeting window. Time Machine Support Entourage didn’t play well with Time Machine. Because every e-mail message, contact, and event was stored in a single, large database file, merely checking your e-mail regularly could force Time Machine to back up a multi-gigabyte file every time it ran. So conventional wisdom said you should exclude your Entourage database from Time Machine backups, and back it up some other way. With Outlook, you need not do this. The database is much smaller, and doesn’t contain all your messages and other data. Instead, these are all stored as small, individual files, which back up quickly. Unfortunately, that’s as far as Outlook’s support for Time Machine goes—you can’t, for example, restore deleted messages from within Outlook as you can in Apple Mail. Preview an e-mail attachment in Outlook by selecting the attachment in the header of a message and pressing the spacebar. Quick Look When you receive an e-mail message with an attachment, you can now preview it in Outlook using Apple’s Quick Look capability. Select the attachment in the header of the message and press the spacebar, or click the Preview button next to it. As long as the file is of a type that Quick Look understands (which includes Microsoft Office, iWork, PDF, and most graphics, audio, and video formats), Outlook displays the contents in a pop-up window. Media Browser For attaching media files to e-mail messages, contacts, or notes, Outlook uses Apple’s standard, system-wide Media Browser. Choose View -> Media Browser (Command-Control-M) to display a floating palette from which you can select any of your media from Aperture, Garage Band, iTunes, iPhoto, iMovie, or Photo Booth. Finally, a bit of bad news, especially for Entourage power users: a few features you may have come to depend on don’t exist at all in Outlook, and don’t have any direct replacements—if you need these capabilities, you may have to stick with Entourage or find a third-party application that does what you want. 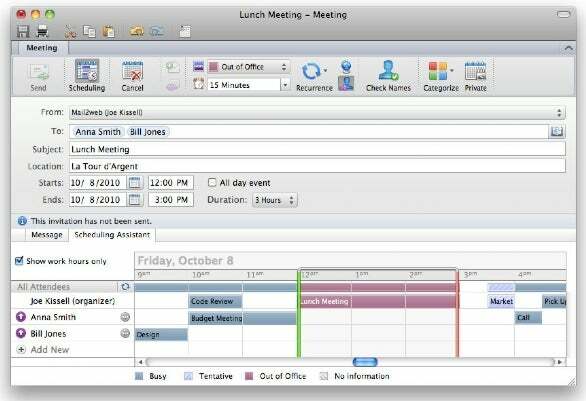 Mini-Month Calendar In Entourage, as in Outlook for Windows, the lower-left corner of the window displays a mini one-month calendar in every view by default. In Outlook for Mac, however, this calendar optionally appears (at the top of the navigation pane) only when you’re in Calendar view. Project Center Entourage’s Project Center provided a central location to view and work with all the resources (e-mail, contacts, events, tasks, notes, and Office documents) associated with a particular project. Outlook simply has no such feature, so it converts your erstwhile Project Center associations into categories. (To edit your categories, go to Outlook -> Preferences and click on Categories.) That lets you find related materials, but doesn’t offer the same range of features—and it clutters your Categories list, too. News Reader Entourage let you connect to NNTP (network news transfer protocol) servers to read newsgroups on nearly any conceivable topic. Outlook doesn’t offer this capability. E-Mail Redirect In Entourage, you could redirect an incoming e-mail message (except for Exchange accounts) to someone else, so that the original sender’s address, not yours, showed as the From address—the command was Message -> Redirect. In Outlook you can forward or reply to a message, but not redirect it. Searching in IMAP Accounts Outlook, like Entourage, lets you search the contents of all messages that have been downloaded to your Mac. However, Entourage also let you search messages on an IMAP server that hadn’t been downloaded. Outlook, alas, can’t do that. Senior contributor Joe Kissell is the senior editor of TidBits and the author of Mac Security Bible (Wiley, 2010).